Firstly, I am the creator / owner / updater of Tisca's Young Rider Page, and so if you have any comments / opinions / suggestions / contributions, please feel free to email me. I am seventeen and live in Perth, Western Australia. 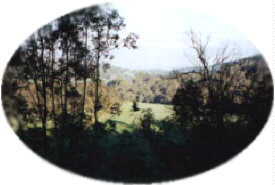 The view from our property in the Darling Ranges is on the right. Around spending way to much time on the internet, I ride my wonderful horse as often as possible, have a casual job to pay for his upkeep and am also a full time student at UWA. I'm a first year Science student and at the moment my major is pretty vague, although I'd love my career to have something to do with horses. Other than horses, my other interests are pretty much watching any top level sport (especially tennis, AFL and equestrian events), playing sport (tennis mostly), reading, writing, drawing (horses!) and wasting hours of time chatting with my friends about pretty much nothing. I am a season member of the Fremantle Dockers and am VERY passionate and emotional about my team. I've been to every single Docker's home game since they entered the AFL (Australian Football League) in 1995 and (not that this means anything to non-Aussies) my favourite player is Brad Dodd. (You can visit the Docker's Website here ). Other useless stuff you may want to know about me is that my favourite movies are The Breakfast Club, International Velvet and Face/Off and my favourite book is Mel by Liz Berry. I also collect some sort of model horse whenever I go on holiday, and get my friend's to buy model horses for me when they go on holidays. I've got models from all over Australia, from New Zealand, Malaysia, Indonesia, Wales and Scotland. The pic on the left is of me (left) and Tanya (very good friend) at our Year 12 Ball in 1997. I decided to not show the pic of us with our dates as...well Tanya knows why anyway. 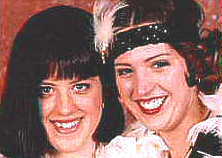 I'd dyed my hair black and Tanya went as a 'flapper' girl - the style of hair/dress from the 1940s. The horse in this background is my old horse, Flint. You are listening to 'Video Killed The Radio Star', one of my favourites.